I stopped the car today in front of a business, and my daughter unbuckled and retracted her rear passenger-side seat belt before exiting the car. Upon returning a minute later, her shoulder belt would not extend no more than an inch or two. I put the car in park and turned off the engine, but the shoulder belt will still not extend even though I pulled on it pretty hard. How do I gain access to the belt mechanism? I know how to remove the lower part of the rear seat, but where are the bolts that hold the upper part of the rear seat located? I assume the upper part of the rear seat has to be removed to gain access to the seat belt mechanism - which is situated under the back dash, and is the back dash difficult to remove too? (1) Remove upper quarter trim panels. (2) Remove one lower quarter trim panel. (3) Remove parcel shelf trim cover. (6) Separate belt from vehicle. (1) Place belt in position on vehicle. (2) Install bolt to hold belt retractor to shelf panel. (4) Install parcel shelf trim cover. (5) Install lower quarter trim panel. (6) Install upper quarter trim panels. Thanks, but any advice for removing the upper back seat cushion, or is that necessary? Actually, I would like to remove the upper cushion anyway as I am dealing with mold from Hurricane Florence (trunk leaked). EDIT: Does anyone know if Chrysler has a lifetime warranty on their seat belts? To remove the rear seat back, you remove the seat cushion first by pulling up at each side to disengage the metal hooks then it should pull right out. 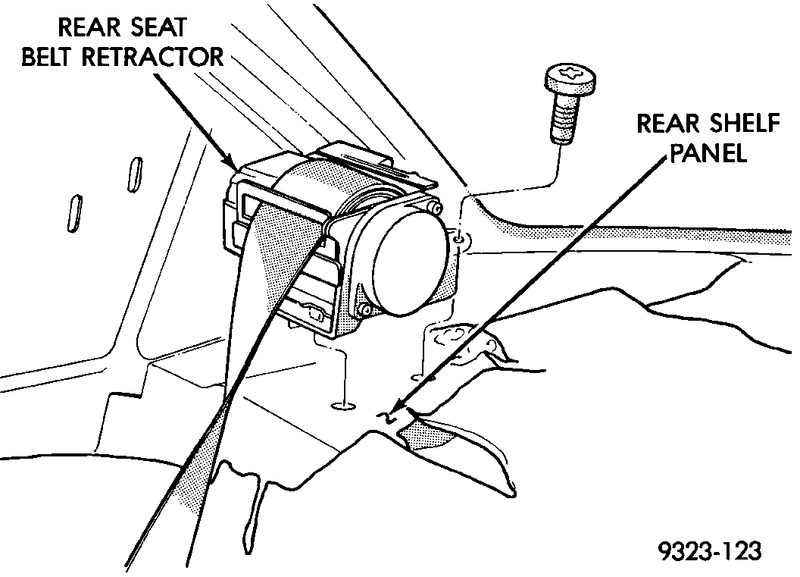 From there you'll see the seat back bolts, remove those then push the seat back up to disengage from the metal hooks. Not sure about the seat belt warranty though. I believe there is, but best to ask the dealership. If you're going to screw around at the dealer to try and solve this WHY? For the time and trouble to eventually be told NO....you could head to a yard and get a replacement and install it. What's a Seat belt cost at the yard $5? You have all the info needed to do a replacement. Just Git-R-Done. Your kids will thank you for it....maybe when they're around 45 years old but at least you got it taken care of! Is it possible to unlock the old belt? I'll certainly consider the junk yard if Chrysler says no (which they just did), but I was hoping I could possibly un-jam / unlock the old belt first. Is it necessary to remove the upper cushion to gain access to the back dash? The instructions you posted earlier did not mention that, but from my initial observations, it looks like removal may be necessary. I managed to remove the entire back seat, the two upper quarter panel trim pieces, and I loosened the right-side lower quarter panel trim, but I could not pull the back dash (shelf) out but just a few inches before I gave up (it was getting dark outside). Are there any wires that need to be disconnected (high-mount brake light, etc.) before the shelf will come out? Sadly, I haven't found any seat belts in the local junk yards yet. A friend has a 1994 model that I can harvest a seat belt from, but the belt color is tan instead of dark gray. Can these seat belt retractors be disassembled to swap out the belts?